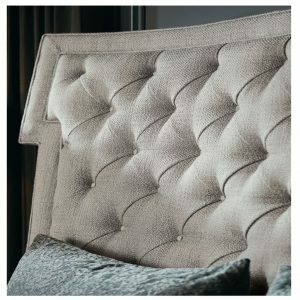 Katzberry carries a unique and distinct collection of quality beds and headboards online. 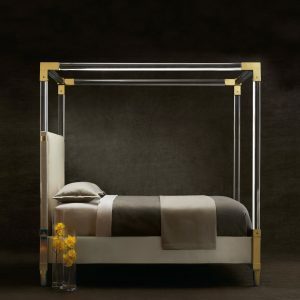 Whether you’re shopping for a brass canopy bed, an upholstered bed, a daybed sofa, or an upholstered scroll bed, you’re sure to find what you’re looking for in our online furniture store. Once you find the perfect bed for your home, browse our website for bedside tables and dressers, chairs and loveseats, cabinets, tables, and more. You can also find comfortable outdoor furniture and home accessories to complete your home decor. We offer 30-day returns for most of our merchandise, so if you’re unhappy with your furniture when it arrives at your door, we’ll gladly issue a refund. 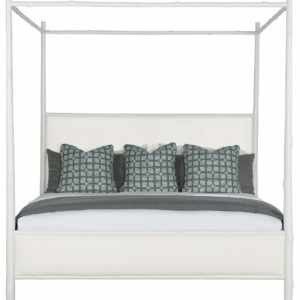 This contemporary Canopy bed has upholstered headboard (backside is black denim), side rails and footboard panel are upholstered with matching fabric. Canopy has Acrylic posts with brass plated metal accent connectors. Brass finished feet. Has 3 slat support system with adjustable center support and adjustable glides. Available in King size. Mattress is not included. 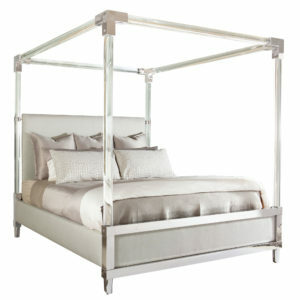 The Arbor Canopy Bed is made to resemble tree branches and soft subtle limb like shaping on the bolsters. 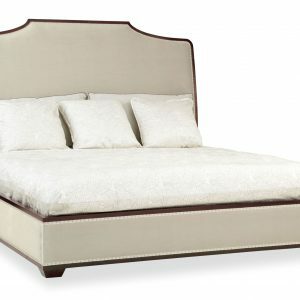 Has upholstered headboard, footboard and side rails in a soft cream color. Currently backordered available in November 26th. 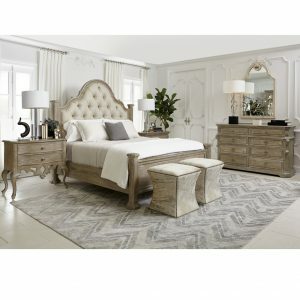 Criteria bed is Heather Gray and has fully upholstered headboard, footboard and sideboards. 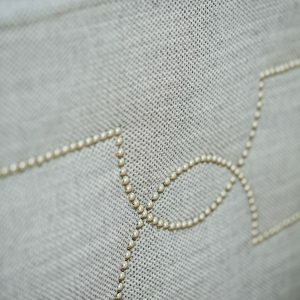 Features a soft gray fabric with welt and decorative nailhead pattern in soft gold. Three slat system with adjustable center supports. Available only in Queen and King sizes. Mattress is not included. Headboard must be used with footboard and side rails. Cannot be used as stand alone headboard. Beautiful curves and scrolls with decorative wood carving detail creates a magnificent center piece. 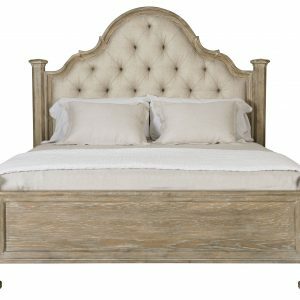 It has weather sand finish on flat cut White Oak veneers, comes with upholstered (button-tufted panel and welt) wood framed headboard, wood footboard and side rails with carved posts. Available in Queen, California King, and King sizes. 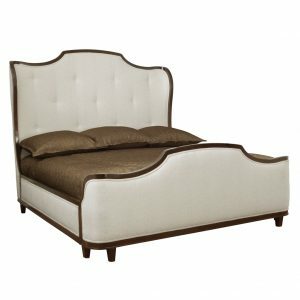 Beautiful curved lines and strong side pillars make up this provincial bed. 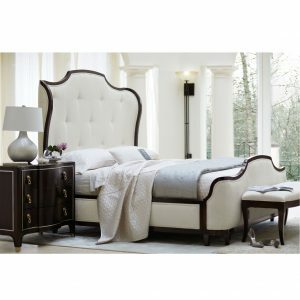 It has weather sand finish on flat cut White Oak veneers, comes with upholstered (button-tufted panel and welt) wood framed headboard, wood footboard and side rails. Available only in Queen and King sizes. Bedding and Mattress is not included. High style and deep comfort meet in the ultimate curl-up-and-relax sofa. Comes with 7 fluffy scatter-back pillows, casually frayed button tufting, hand-stitched cushion channeling and a sculpted wood base. 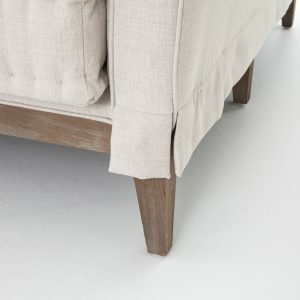 Sofa and pillows come in Light Sand fabric and white washed wood legs. 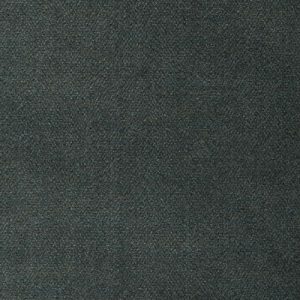 Upholstered in a soft gray fabric and an open plated stainless steel decorative overlay. Canopy has stainless steel rails with tarnished Nickel finish. Has matching upholstery with metal frame and posts around footboard and side rails. It has a three slat support system with adjustable center support. Mattress is not included. Headboard must be used with footboard and side rails. Cannot be used as stand alone headboard. 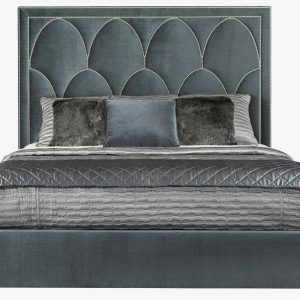 Upholstered in a soft gray fabric, button tufted with welt on headboard. Matching upholstery around footboard and side rails. Finished with exposed wood legs in white Dove finish. It has a three slat support system with adjustable center support. Available in California King, King and Queen sizes. 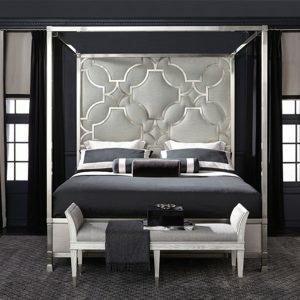 This bed comes with a Wood-frame all around and upholstered panel headboard with tape and spaced nailhead trim border. Has 3 slat support system with adjustable center support. Wood finish is Haven Brunette. Available in Queen and King sizes. Mattress is not included. Headboard must be used with footboard and side rails. Cannot be used as stand alone headboard. 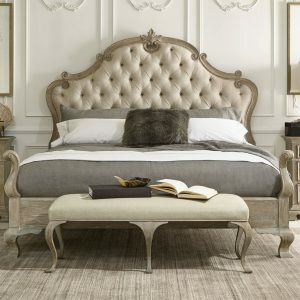 Beautiful coved sides and curved lines on head board and footboard makes this bed elegant and sophisticated. It has Upholstered headboard with button detail, footboard and side rails in a off-white fabric and finished with beautiful wood trim in Dark Sable. It has a 3 slat support system with adjustable center supports. Headboard must be used with footboard and side rails. 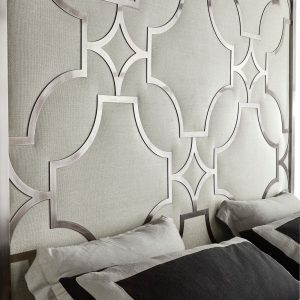 Cannot be used as stand alone headboard. 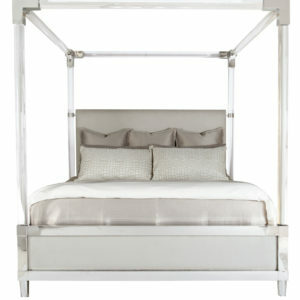 The Rayleigh Canopy Bed has a contemporary feel yet is as cozy as it gets. It has Polished Stainless Steel detail and trim with contemporary acrylic canopy bolsters. 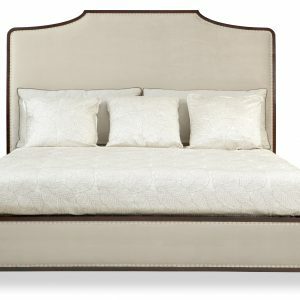 A soft to touch light grey fabric upholsters the headboard, footboard and side rails.